Today's tutorial is brought to us by Ellen. She made these really cute card holders for an OWH event recently, and since so many people are hosting Birthday Bashes this month, we thought everyone would enjoy learning how to make them. Cut craft sticks in half making them approximately 3” x 1”. Lay the clothespins out on your working surface with about 1 3/4" in between them. Glue 2 of the cut craft sticks on the clothespins – one at the top of the pins, (let a little bit of the pin show)the other with the stick below the metal spring with the sticks overlapping the pins by about 1/4". (Use enough glue to make them stick good. It helps if you put a weight on the sticks while they are drying.) Let dry. Turn the pins over and do the same thing on the other side. While the second side is drying, stamp the white cardstock with an Operation Write Home stamp and attach or stamp stars or other decoration to it. When dry, attach the white cardstock to the colored cardstock and then the completed front to one side of the prepared clothespins covering the top craft stick completely. To use, it is best to open both clothespins at the same time while inserting your card. Enjoy your stands. Thanks again to Ellen for today's tutorial. Ellen doesn't have a blog, so be sure to leave a comment and let her know what you think. 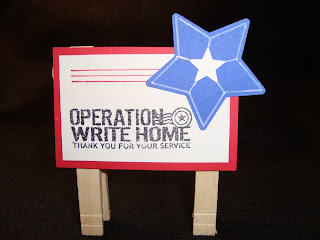 As always, if you have an idea for a Tuesday Tutorial, please write kate@operationwritehome.org. What an adorable and useful idea...I could use it when I take pictures of some of my cards that are awkward in standing up when positioning them for a picture. thanks for a great idea. These work great too. They were holding up cards at the OWH card making party at Esther's yesterday and they are so much better than other card holders I've used. Yay Ellen!